Coca-Cola, known for releasing memorable Diwali-centric marketing communications, has rolled out a new TVC. With the theme - 'Iss Diwali, Har Dil Bola Tere Naam Ki Coca-Cola' - the campaign inspires consumers to make the festival of lights special for someone. Conceptualised by McCann Worldgroup, the ad film has been produced by Curious Films and directed by Vivek Kakkad. Titled 'Share a Coke this Diwali!' the TVC has been created on the core message of connecting cultures and features Ayushmann Khurrana and Anupriya Goenka in the lead roles. This ad film seems like a rub off of a Hindi masala movie where Ayushmann (the protagonist) depicts a boy from Delhi living in southern India. The actor plays the role of a tenant away from his home on Diwali. His neighbour (Anupriya) hears him on the phone with his mother saying that he misses Delhi's Diwali. So, she and her family take it upon themselves to make the festival of lights a brighter one for Ayushmann. There also seems to be a subtle romance between the two characters as well. Speaking about the insight on which the campaign is based, Prasoon Joshi, chairman - Asia Pacific, CEO and CCO India, McCann Worldgroup, says, "India is a beautifully diverse country especially when it comes to festivals; we have a lot to celebrate and share. This campaign is trying to make a suggestion of getting to know each other's festivals better and celebrating them together for a more united and connected world." 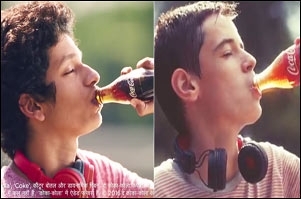 Coca-Cola has altered its jingle - Har Dil Bola, Tere Naam ki Coca-Cola. The music for the background score, created by Abhishek Arora, only enhances the viewability of the TVC. 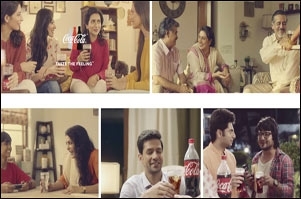 The multi-faceted campaign includes a number of consumer touchpoints including multi-city social media marketing activations like #ShareAWish, where consumers can share their customised Diwali wishes on Coca-Cola India's social media channels and journey in their own languages through greetings, GIFs and voice messages. These messages will also be displayed through outdoor marketing along with the name of the well-wishers. Shrenik Dasani, vice president - sparkling category, Coca-Cola India, says, "Coca-Cola's Diwali campaign brings to audiences a message of sharing and celebrating moments of joyful human connection. It gives a festive call to taking that small step and making someone's Diwali more special so that they are among 'their own' people no matter where they happen to be!" "Coke extends Ayushmann Khurrana's on-screen Delhi image to Diwali spot..."
Coke, as a brand, doesn't advertise as frequently as its rivals. One can expect an ad campaign from Coca-Cola either in summer or during peak festive seasons. Over the years, the brand has released some memorable campaigns around Diwali. Last year, the brand launched a campaign celebrating 'Sibling Love with Coca-Cola'. In that campaign, a younger brother is shown bullying his elder sister, but when he sees her looking tired after doing all the preparations for Diwali at home, he pours her a glass of Coke and wishes her a Happy Diwali. In 2016, the brand launched five TVCs under the 'Coke Nawaazi' campaign. The TVCs, conceptualised by McCann India, focused on the 'desi' insights of how a 'mehmaan' (guest) reacts after being offered something to drink. Among the most memorable initiatives by Coca-Cola, the brand's 2010 Diwali campaign was the most impressive. The brand took its TVC beyond television sets. The thought in the TVC - to celebrate togetherness - was extended to OOH properties across 20 towns in five states. The idea behind the OOH campaign was to celebrate homecoming for Diwali, with Coke. Animated Warli characters appeared on the Coke creatives, performing actions that symbolised celebrating Diwali at one's home, with one's family. Earlier, if Coke would rope in a celebrity - Aamir Khan, Hrithik Roshan et al - they would stay for a while or a few years. Now, it's a lot less. We asked the experts how the life-cycle/longevity of a brand ambassador has changed over the years. According to Naresh Gupta - chief strategy officer and managing partner, Bang in the Middle, more and more brands are looking at standing out of the clutter every day and one way to do that is to keep the brand fresh. He says, "Using an ambassador for a prolonged period is one way, using those who are in the news topical, is another. Brands need to tell stories that are consistent and there is no reason to stick to one formula." Gupta adds, "Ayushmann is popular right now; he is performing much better than most of his contemporaries. It is a good way to leverage his goodwill at this time. Diwali in southern India is very different from the north and this is a good way to leverage the festive feel across geography." Samit Sinha, managing partner, Alchemist Brand Consulting, says, "This particular campaign was obviously created to coincide with Diwali to keep the brand salient during festivities that typically involve indulgence in food and drink. Rather than rely purely on celebrity appeal, the choice of Ayushmann and Anupriya seems to suggest that Coke's intention is to use their everyman/everywoman, boy/girl-next-door image to create greater emotional empathy towards the brand amongst India's middle classes. It is perhaps a bit skewed towards North India since the celebration of Diwali also tends to be. Of course, Ayushmann's recent box-office success, as an indication of his increasing popularity, could also have tipped the decision in his favour." Was the campaign well executed? Rohit Raj, creative chief and co-founder, The Glitch, opines that earlier coke films had a certain style which made it instantly recognisable. "Here, I assumed this to be an ad for Cadbury, till the product showed up. In the clutter of emotional ads, especially in the food and beverages segment, this becomes another similar ad for me." Gupta says, "Cold Beverages broke the seasonal barrier long ago, they are now all-weather brands and for Coke to be present during festival time, is good. The product is neatly integrated. Coke and Diwali have been a very good combo for many years anyway."